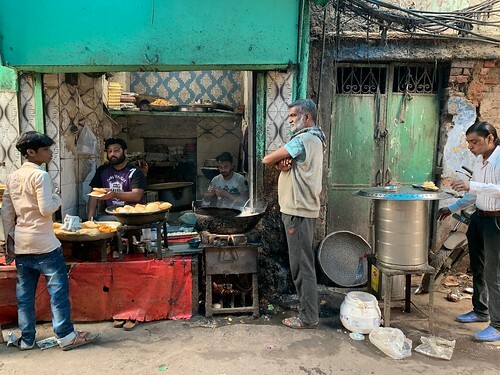 Muhammed Sajid’s mithai shop in Old Delhi’s Turkman Gate Bazaar is as fickle as a moody chameleon. It shows different colors at different times of the day. In afternoons you see the young man and his assistants frying golden-brown jalebis in a giant cauldron. In the night, they sit beside stacks of black gulab jamuns, while the shop glows in white light. 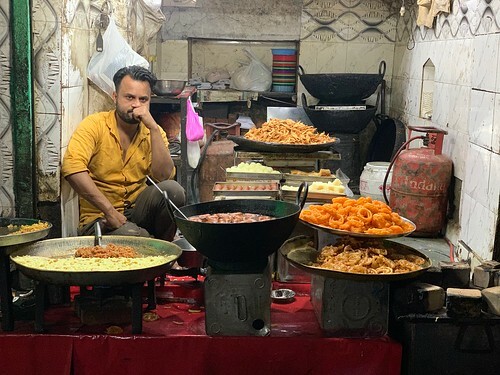 In mornings the counter has a giant platter filled with Mr Sajid’s yellow sooji halwa–the peculiar color coming from the addition of zarda. 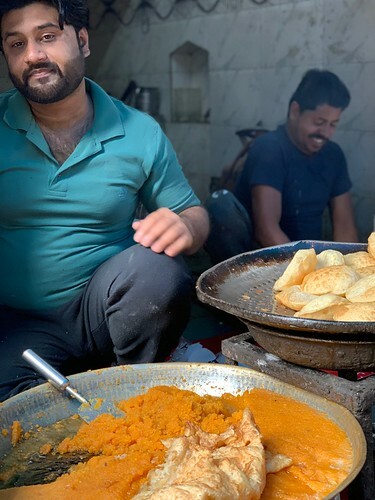 The Mughal-era quarter has a large number of breakfast places offering fairly good to unusually excellent sooji halwa, which the area’s hyperlocal citizenry likes to lick clean with freshly-fried pooris or super-flaky parathas. 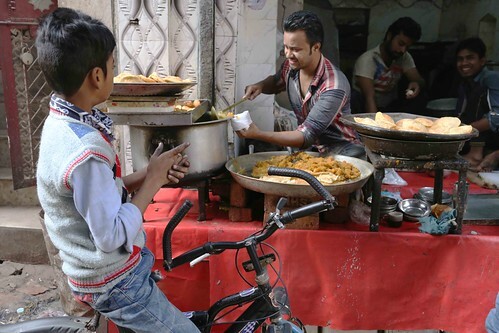 The halwa at the landmark Shree Bhawan, near Chitli Qabar Chowk, is famously made in desi ghee. Kallan Sweets in Matia Mahal Bazaar and Ameer Sweet House near Haveli Azam Khan also have their loyalists. The relative anonymity of Mr Sajid’s establishment adds to its novelty. The place is still to be discovered by camera-toting flâneurs and food bloggers. You’ll see only locals. The halwa platter on the counter-table is supported on bricks. 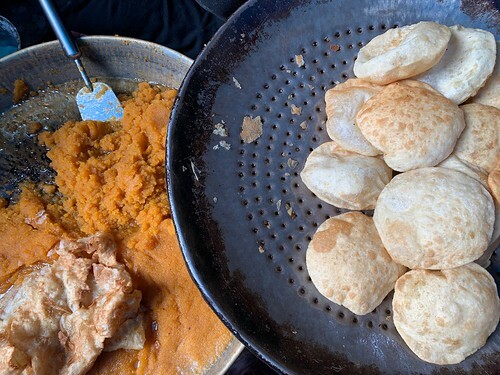 People going about on their morning errands often stop absentmindedly in front of the shop, and are served the dish before they could ask for it. Some customers don’t even get off their bikes. Those parents who feel too lazy during the early hours to prepare school meals for their kids simply fill the plastic lunch boxes here with halwa and poori (this is true for the area’s other halwa shops too). 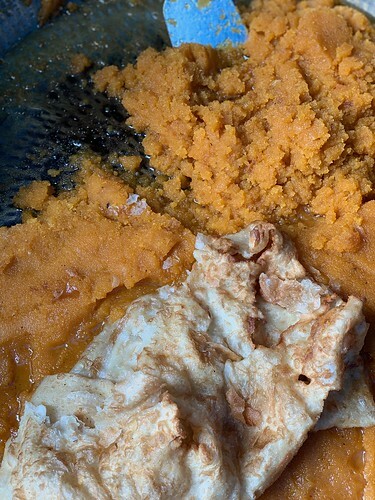 A burner underneath the platter keeps the halwa piping hot. The parts of the platter far from the flame show a waxy white ring; that’s the condensed ghee. It is however heartbreaking to watch the steam rise innocently from the cardamom-flavoured dish and disappear into the polluted Delhi air. By noon, Mr Sajid’s halwa becomes a memory.